Illinois Reforms: Who Blinks First? The brinksmanship continues in Illinois. A moderately effective reform bill passed the senate but has been defeated in the house by Republicans, who seek stronger ways to limit compensability. As a result, the Dems are moving forward with the Doomsday option: a bill to abolish workers comp and send each and every claim into the court system. Wow, that’s one way to make everyone miserable, above all, injured workers looking for a reliable safety net. Among other things, the defeated reform bill would have reduced the medical fee schedule by 30 percent, thereby saving (theoretically) $500m to $700m per year. The reduction sounds harsh, but in practice, fee schedules are fluid. For top specialists, the fees are almost always negotiated upward; for run-of-the-mill practitioners – or the Dr. Feelgoods with their pockets full of pills – they can take it or leave it. Lowered fee schedules provide payers with leverage to find the best available doctors – not necessarily a bad thing. At the moment, legislators are playing a classic game of chicken: if we can’t reach agreement on reforms, we’ll blow the whole thing up. Given that Democrats are behind the Doomsday option, I doubt they will allow things to reach that point, as it would be a disaster for workers. But they are running out of time. The potential good news for Illinois employers (and there isn’t much when it comes to comp) is that even the modest changes in the reform bill will begin to reduce the cost of workers comp, currently the third highest in the nation. The bad news is that further reforms will be needed, most of all, perhaps, involving the de-politicizing of comp in a hyper-political state. My advice to the legislators is simple: take it incrementally. Pass the reform bill pretty much as is and revisit the issue in the next session. In this precarious situation, half a loaf is better than none. Posted in Best Practices, Compensability, State News | Comments Off on Illinois Reforms: Who Blinks First? Chris Fleming hosts a substantive Memorial Day issue of Health Wonk Review at Health Affairs Blog – there are a lot of good submissions on a variety of topics, from Medicare and the Affordable Care Act to quality and healthcare IT. Our highways are increasingly being populated with an array of new vehicles, from hybrids to electric cars and variety of lesser known technologies. And every time the cost of gas spikes, more and more consumers consider the options. A newly released J.D. Power and Associates study indicates major growth in consumer interest in green cars. The firm expects as much as 10 percent of sales to come from fuel-efficient vehicles by 2016, which would be a four-fold increase in green car sales over 2010. The Chevy Volt, a plug-in hybrid electric vehicle (EV), has been on sale in the U.S. market since mid-December 2010. By next year, GM believes it can sell as many as 60,000 Volts and Amperas. And other EVs have also made a recent debut: the Nissan Leaf and the Ford Focus, to name but a few. New technologies pose new challenges. When firefighters, police and other emergency personnel respond to a vehicle collision, they need to be up to speed about these new technologies and any hazards they may pose during extrication and resue. These include risks related to electric shock, unintended vehicle movement due to multiple energy sources, new types of vehicle batteries, fire extinguishment/overhaul, and vehicle charging stations and infrastructure associated with electric vehicles. The National Fire Protection Association (NFPA) has geared up for the challenge. Funded by $4.4 million grant from the U.S. Department of Energy and working in partnership with several vehicle manufactureres, the NFPA has launched an Electric Vehicle Safety Training program to help firefighters, police, and emergency medical technicians to prepare for the growing number of electric vehicles on the road in the United States. Training will encompass videos, classroom-training courses, self-paced online programs, and simulations to help first responders navigate the science and components of EVs, plug-in EVs, and hybrids. Training programs will help first responders ascertain whether the car is disabled or not, provide information about how to power down vehicles, demonstrate how to safely disconnect the high-voltage system, and show safe cut points for extrication. Bonus: Firehouse.com offers a behind the scene look at the filming of the program’s video staring N.H. and Nev. firefighters. The National Alternative Fuels Training Consortium (NAFTC) is an alternative fuel vehicle and advanced technology vehicle training organization. It is headquartered at West Virginia University and consists of National Training Centers (NTCs) located nationwide from Maine to California. NAFTC develops curricula and disseminates training about alternative fuel vehicles and advanced technology vehicles. Over 1,000 organizations such as Walt Disney World, U.S. Air Force, and NASA have participated in the NAFTC’s training, education, and outreach activities. NAFTC educates consumers about AFVs and advanced technology vehicles. In addition, the NAFTA curricula offers First Responder Safety Training in Hybrid Electric Vehicles and Hydrogen Vehicles. Last year 29 coal miners died in an explosion at Massey Energy’s Upper Big Branch Mine in West Virginia. Don Blankenship, Massey CEO, blamed the explosion on federal interference and a gigantic methane bubble that percolated up from below the mine shafts. The bubble has burst, but not in the way Blankenship would have you believe. An independent team appointed by the former West Virginia governor, Joe Manchin, and led by the former federal mine safety chief Davitt McAteer, has issued its findings, which are both unambiguous and scathing. There was no methane bubble. There was, instead, a pattern of negligence by management that led directly to the deaths of the miners. Given the uncompromising language of the report, Massey management may not enjoy the “exclusive remedy” protections of the workers comp statute. They are now vulnerable to charges of criminal negligence. I suspect that attorneys for the widows and children of the miners will look rather closely at the assets of Massey’s (now former) CEO. Don Blankenship resigned from his CEO post in December of last year. Don’t bother putting up a collection to buy this ethically-challenged titan of business a gold watch. In 2009 he earned $17.8 million, which does not include deferred compensation of an additional $27.2 million. There is no question that Blankenship’s leadership created profits for the company. Unfortunately, these profits came at the expense of the environment and of the men who extracted the coal from the West Virginia mountains. The anecdote that tells you a lot about Blankenship involves his personal water supply. When Massey Energy activity poisoned the water reaching his own home, Blankenship ran a private pipeline to the next town, where clean water was readily available. His neighbors, lacking Blankenship’s resources, have to make do with the local, polluted water. It will be interesting to see what happens next. In a just world, Blankenship would be held accountable for his actions as Massey’s CEO. But we do not live in a world where justice prevails very often. Blankenship will likely continue to enjoy his retirement years, drinking clean mountain waters, railing about government interference, buying a few politicians and generally living the good life. We can only hope that each and every night his dreams are haunted by visions of the 29 miners and their struggling families. That would be one form of justice indeed. Cavalcade of Risk – Emily Holbrook is hosting the 131st edition of Cavalcade of Risk at one of our favorite risk-related blogs, Risk Management Monitor. Check it out! 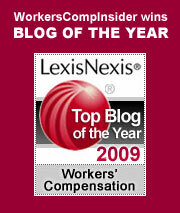 Compensability issues – In disputes as to whether an employee’s injury or illness is eligible for benefits, courts look at the issues of whether the injury arose in the course and scope of employment. Roberto Ceniceros posts that while course and scope have generally been regarded as a single doctrine, that may be changing with the challenges posed by an increasingly mobile work force. See his blog post: “Course and scope” separated. Safety for the solitary worker – Speaking of a mobile work force, do you have workers who work alone? Solitary work poses unique safety challenges. See Safety Daily Advisor’s tips for keeping solo workers safe. Claims IT systems webinar – Health Strategy Associates has an upcoming webinar that may be of interest to some of our readers: the results of HSA’s First Annual Survey of Workers Comp Claims IT Systems. If the sponsoring organization’s name isn’t familiar to you, it’s our fellow blogger and friend Joe Paduda’s firm – he’s sponsoring the seminar in conjunction with colleague Sandy Blunt. If this interests you, act now – the webinar is scheduled for tomorrow! Mining safety, one year later – On last week’s anniversary of the West Virginia Big Branch mine disaster that claimed 29 lives, the latimes.com looks at progress – or lack of progress – in enhancing miner safety: Families of dead miners feel let down by Washington. The story reports that in the past year, a safety bill has failed and the backlog of safety cases has grown. Top HR issues – Workforce covers the top 10 HR concerns as reported by the Employers Resource Association. These issues are compiled from the more than 8,000 hotline calls made by the organization’s membership of 1,300 companies in Ohio, Kentucky and Indiana. Mousing elbow – As we incorporate more and more devices in our work-world, technology-related maladies seem to multiply. Greg LaRochelle of the MEMIC Safety Blog talks about Mousing Elbow and how to prevent it. See also Blackberry Thumb, Cell Phone Elbow, IPod Ear. Also, see our ergo tips for setting up a workstation. Hidden costs – We all know the health risks of smoking and that smoking can contribute to comorbidities that hinder worker recovery. But there are lesser known risks that can contribute to claim costs, In PropertyCasualty360, Zack Craft of Total Medical Solutions talks about how smoking can damage sensitive medical equipment too, and a factor that adjusters should consider. Illinois Comp: The Nuclear Option? Illinois is struggling mightily with its bloated workers comp system. Currently ranked 3rd highest for overall cost in the Oregon study, the governor and legislature are under intense pressure from the business community to lower the cost of comp insurance. Aiming its powerful bulldozers at the state capital, the Caterpiller Company has threatened to move their business somewhere else if reforms are not implemented immediately. In exploring all options, the legislature has gone so far as to think the unthinkable: abolishing workers comp. In looking for ways to save money, Illinois does what all states do: first, identify the cost drivers and then try to change the statute to bring down costs. Among the hot issues on the table are the medical fee schedule (too generous), employee choice of doctor (too flexible), duration of benefits (too long), causation (too vague). Ah, behind every cost driver is a vested interest (perhaps literally vested, with many of the lobbyists wearing three piece suits). The common denominator among all states struggling with high comp costs is the omni-present stakeholder, who is deeply committed to the status quo. Governor Quinn would like to see a number of reforms, including the capping of carpal tunnel benefits, denying claims where employee intoxication is a significant factor, attacking fraud (see our blog on Illinois’s dubious arbitration services), capping wage differential benefits at age 67 or five years after an injury, and implementing utilization review for physical therapy, chiropractic and occupational therapy services. The Illinois legislature is so frustrated with the slow progress and with stakeholder resistance to change, they are now threatening to blow up the entire system. Interesting to note, this pressure is coming from the Democrats. John Bradley (D-Marion) has filed House 1032, a bill to repeal the workers comp act and send all workplace-injury issues into the court system. Should this happen, Illinois will find itself in the world prior to 1912, when injured workers had to sue their employers and could collect benefits only if their injuries were caused by someone other than themselves. They would collect no benefits while awaiting adjudication of their claims. They would be out of work and out of luck. In all likelihood, repeal of workers comp is not a serious option in Illinois; it’s a political strategy for getting the attention of inertia-bound legislators. But the prospect of abolition does raise an interesting issue. Workers comp came to America 100 years ago. By the end of the World War II, every state had implemented the program. What if there were no workers comp programs today? What if each state were starting from the beginning and tackling the issue of protection for injured workers? I find it hard to imagine that state legislatures would be willing to implement a program, totally funded by employers, that provides indemnity for lost wages and 100 percent medical benefits for injured workers. Why so generous? Why so inclusive? It’s too expensive. It will create disincentives for working. The cost will drive employers out of business or out of state. With today’s acrimonious, ideology-driven debates, workers comp would be a hard sell. That’s too bad, for despite its problems and inequities, despite the wide variations in benefits and costs from state to state, comp is a compelling example of effective social engineering. In Illinois, cooler heads will likely avoid the meltdown option. To be sure, Illinois comp is a mess, but the alternative – a workplace without workers comp – would be far worse. Posted in Best Practices, Compensability, History, State News | Comments Off on Illinois Comp: The Nuclear Option? Did you miss your biweekly dose of heath wonkery last week? Grab a cup of Monday morning coffee and catch up now with news from the best of the health blog pundits – Hank Stern hosted a concise compendium in his Health Wonk Review Spring Renewal edition at InsureBlog. Thanks, Hank! A couple of days ago my colleague Julie Ferguson blogged OSHA’s new focus on farm safety. We all share the concern for the safety of farm workers. But OSHA is upping the ante in a way that requires the immediate attention of both insurance companies and their clients. As part of their investigation into the deaths of two teenage workers in a silo operated by Haasbach LLC, OSHA issued subpoenas for documents from Haasbach’s insurer, Grinnell Mutual Reinsurance Co. OSHA wanted to review safety inspection reports and any follow up documentation from Haasbach. The insurer refused, arguing that the subpoena would discourage businesses from allowing insurers to conduct safety inspections if the material contained in the inspection reports can be used against a business during later litigation or OSHA enforcement proceedings. The court ruled that OSHA has jurisdiction to investigate the workplace fatalities, and further has the authority to require the production of relevant evidence and the ability to issue a subpoena to obtain that evidence. The requested documents, which included copies of site safety inspections, applications for insurance coverage for the site, and correspondence between Grinnell and Haasbach concerning the site, were found to “reasonably relate to the investigation of the incident and the question of OSHA jurisdiction,” according to the decision. The court’s ruling has important implications for both insurers and their clients. Insurers are required to provide safety services, including site inspections with the findings documented in written reports. Usually, the safety inspector asks for a written response within a set time period. With OSHA potentially accessing these reports, there is liability for insurers: did they identify safety problems? Did they follow up to ensure that the problems were fixed within a reasonable period of time? It’s another version of the great liability question: what did you know and when did you know it? Similarly, the documents put insureds at risk. Safety issues have been identified. How did the business respond? Did they fix the problem? Did they perform the necessary training? Did they document their activities to show good faith in correcting identified concerns? In all of this activity, candor is essential. The last thing anyone wants – and that anyone certainly includes OSHA – is for this court’s ruling to have a chilling effect on the routine inspections performed by insurance companies. The concern is that inspectors, sensing OSHA reading over their shoulders, might hedge the findings just a bit – enough, perhaps, to create an ambiguity in the finding that results in an ineffective and unfocused response by the insured, which, in turn, perpetuates the hazard and leads, perhaps, to a serious injury or even death. That would be an unintended consequence of tragic dimension. As always when OSHA becomes involved, there is a lot of money on the table. Following the fatalities, Haasbach was issued 25 citations with a penalty of $555,000. This was in response to the situation where three (untrained) workers became entrapped in corn more than 30 feet deep. At the time of the incident, the workers were “walking down the corn” to make it flow while machinery used for evacuating the grain was running: all in a day’s work on the farm, and extremely hazardous. It is certainly not in the best interests of insurance companies and their clients to build defenses against potential OSHA involvement. If we all share a commitment to safety – and we must – then an open and candid dialogue is essential. To be sure, both insurers and their clients are “on the hook” once problems have been identified. But surely it is in their combined interests to fix those problems as quickly as possible. Insurers and their clients must keep the focus where it belongs: not on OSHA, but on the moment-to-moment, day-to-day safety of workers on farms, in factories and in every American workplace.